French prosecutors have launched a formal investigation into whether Malaysian Prime Minister Najib Razak, already under pressure over graft claims at home, was paid bribes to secure a long-contentious US$1.2 billion (S$1.68 billion) arms deal when he was defence minister. A judge will probe whether French defence group Thales International Asia's former president Bernard Baiocco paid illegal kickbacks to Datuk Seri Najib via an associate of the latter to win a 2002 contract for two submarines. The deal was later to come to the attention of Malaysians, after the 2006 murder of a Mongolian woman translator involved in the negotiations gripped the nation. According to the British newspaper Financial Times in a report yesterday, French prosecutors confirmed that Baiocco was being probed for "bribery of foreign public officials" and "complicity in misuse of corporate assets" in relation to the sale of the Scorpene submarines to Malaysia by Thales and its partner DCNS. 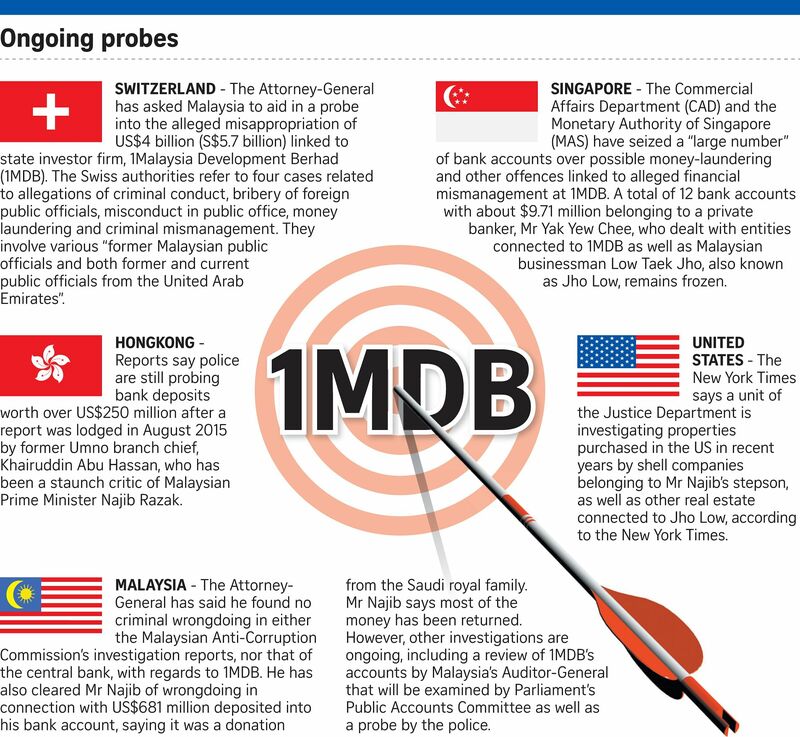 The newspaper said his lawyer Jean-Yves Le Borgne revealed that the persons named by the court documents were Mr Najib and the middleman Abdul Razak Baginda, a defence analyst in a Malaysian think-tank then. Wire agency Agence France- Presse reported that Baiocco was formally indicted on Dec 15 after 48 hours in police custody. However, all three men have denied wrongdoing, according to FT.
A Malaysian government spokesman was quoted as saying that claims that Mr Najib received payments linked to the contract were "baseless smears for political gain" and there has not been any communication from the French investigation team. The Prime Minister's Office told The Straits Times it had no further comment to add. FT quoted Mr Le Borgne as saying: "There was no corruption. The money paid by my client's company to Mr Baginda was for lobbying." "They (the prosecutors) suspect the minister received some money but they have never had anything to prove that." Mr Razak told FT that the €30 million (S$47 million) he received from Baiocco was part of a "legitimate agreement" to consult and oversee the eight years of the deal's execution. "I did my job and I got paid for it. And I never paid any official," said Mr Razak, who in 2008 was acquitted of the murder of the Mongolian woman Altantuya Shaariibuu. Two policemen were convicted of the murder of Ms Altantuya, who was 28. At the time of her death, the two were part of a special unit that provides security to official VIPs. She was blown apart by explosives after being shot, in a forest near Kuala Lumpur. One of the two men, Sirul Azhar Umar, fled to Australia where he sought asylum. A recent video surfaced in which he said the Premier was not involved in the killing. Mr Razak, now director of the Britain-based Islamic Peace Foundation, has said Ms Altantuya blackmailed him but that she had threatened to expose their intimate relationship rather than details of the submarine deal. Mr Najib has said he knows nothing of the Mongolian woman whom he has never met. The revival of the submarine controversy comes just after Mr Najib was cleared of wrongdoing by Malaysia's public prosecutor over US$700 million found in his personal accounts. While Attorney-General Apandi Ali saw no crime in receiving the money, there is growing pressure from foreign investigators - from Switzerland, Hong Kong and Singapore - looking into graft claims over allegations of financial mismanagement in 1Malaysia Development Berhad (1MDB), a state investor whose advisory board Mr Najib chairs.